It’s been a while since my last blog post, but then it’s been even longer since Aphex Twin last put an album out, so I figured it was a momentous enough occasion to write something up. I should have got this published when my pre-ordered copy arrived through the post on Saturday morning, but I was off oop north this weekend doing a Mixmag interview feature thing, so I’ve somewhat missed the jump on the rest of the music media. The extra couple of days have however given me a bit more time to muse on Richard D James’ first proper work for 13 years however, so here’s something resembling a review. If you do actually buy the thing, then you’ll be privvy to all the expenses incurred in its production, as everything from the ‘shrink wrap’ to ‘Leah’s taxi from Warp office to radio station’ is listed and costed on four folds of the cardboard CD case. Not only that, but the inlay sheet features a fairly exhaustive list of the equipment used in the creation of Syro’s sonics. It means very little to the likes of me, but will no doubt have his hordes of techy fans out scouring the internet for the kit needed to emulate their hero. As for the music, the lead single and first track, Minipops 67 (source field mix) probably remains my favourite piece on the whole album. With a skittish breakbeat, loose arrangement and pleasant synth stabs it wouldn’t sound out of place on that recent Plaid album and is the perfect way to coax in new listeners. It’s followed by a few similar sounding tracks, the dreamily epic XMAS_EVE10 (thanaton3 mix) and Produk 29, which sounds a bit like fellow Cornishman Luke Vibert. This downtempo electronic noodling continues into the fourth song and as Resident Advisor’s 5-star review pointed out, gives the record a sort of incidental, timeless feel, in the sense that it doesn’t fit into any current genre trend. The acid begins to seep in by fifth track 180db and some of the old spastic sounds are evident on CIRCLONT6A, bleeping and blooping into CIRCLONT14 and Syro U473t+E. The next couple are where he really digs deep into his musical history though, unleashing a bruising jungle break over the synth washes of Papat4 (Pineal mix) and going full old skool drum pattern on the superb S959tx16wasr10 (nice to see he’s still bang up for the unrepeatable track titles as well). The whole thing is then wrapped up with the serene piano arrangement of Aisatsana; apparently an ode to his Russian wife Anastasia. Have a squatch yourself via Spotify and let me know what you think. I really enjoyed it, probably more so than some notable other recent dance music comebacks. It doesn’t quite have a standout track to match some of those I’ve listed at the bottom of this post, but it’s his most consistent work for a good few albums. Here’s hoping Richard’s thawing of previously frosty media relations doesn’t mean he loses all his mystique, but he does follow through on promises to release more pent up material soon. Given its been well over a decade since we’ve had any new music from the man though, it’s probably worth a few paragraphs analysing what’s been allowed to build up in the void. Of course this kind of obfuscation is nothing new from Mr James, who has let legends flourish through rarely giving interviews or playing live shows. As the interview below shows, he’s something of an introvert individualist, or at least is happy to let that reputation grow, in order give him time to work on his wonderful creations. From what has been pieced together by other journalists far better connected than I, the man has a fascinating back story (or is a brilliant bullshitter). 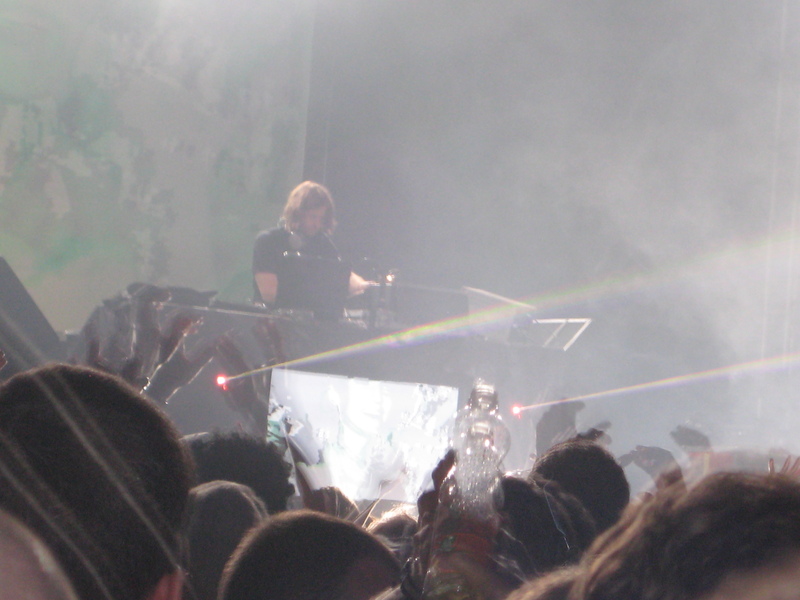 Born in Limerick but growing up in Cornwall, his moniker is supposedly a combination of audio equipment manufacturer Aphex Systems with his (not actually a twin) brother – also named Richard James – who apparently died during birth. Mucking about with machines as a child, he claims to have reprogrammed a soundless ZX81 computer to make weird noises at age 11, and according to Tom Middleton’s brother, started producing music the following year. 1991 saw the release of the Analogue Bubblebath EP on Mighty Force Records, but soon after James set up Rephlex Records with his friend Grant Wilson-Claridge, putting out two more bubblebaths. Moving to London a few years later to further his studies, he signed up to Warp for a few more records under various aliases, allegedly living on the Elephant and Castle roundabout and a disused bank, but probably just a bedsit nearby. The seminal Selected Ambient Works 85-92 came out on R&S Records in 1992, in stark contrast to his other release that year, the dance-floor melting Digeridoo. Despite an obvious reluctance to personally promote his work, 1995 album I Care Because You Do sported his maniacal mug; something repeated the following year on the Richard D James Album. While media shy, his face became the stuff of nightmares for many, courtesy of the similarly twisted brilliance of Chris Cunningham, who directed the memorable videos for Come to Daddy and Windowlicker. 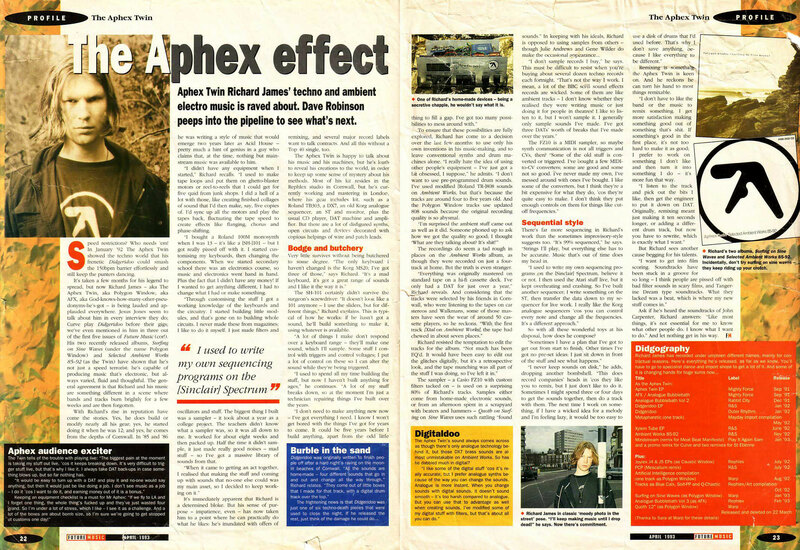 Towards the end of the 90s Aphex Twin stated he would only be making music for his own consumption, but after supposedly accidentally leaving an MP3 player full of his tracks on a plane, he decided to take the upper hand on any unauthorised distribution by releasing Drukqs in 2001. Confirming his attitude towards the necessary evil of releasing music, in 2003 he put out 26 Mixes For Cash, a collection of the remix work that he had put some effort into (one story goes that after forgetting about a commission to edit The Lemonheads, he sent an old gabba demo and ended up getting paid four grand, while a Madonna mix was only agreed upon her having to do a pig impression). A year later he returned as AFX, drip-feeding the Analord series of 42 tracks over 11 vinyl EPs, and latterly a CD collection called Chosen Lords. In 2007 rumours abounded that he was back as The Tuss, although this was strenuously denied at the time. In recent years I’ve been able to see him a couple of times, firstly courtesy of the Warehouse Project at Matter nightclub in 2009, and then the following year at the LED Festival. It’s fair to say his live shows are unique, and while not as abrasive as the infamous sandpaper/food mixer gigs, a lot of the stuff he played did stretch the definition of ‘music’ for me. I’m not half as big a fan as some of my friends, being only willing to go so far up the beats per minute scale or down the rabbit hole of industrial noise. But if you can get past some of the less accessible sections of his back catalogue, it’s easy to hear why so many people proclaim him as a genius. A true British eccentric, his skill comes from manipulating machines in previously un-thought-of ways, eeking incredible sounds out of synthesisers to make serene electronic melodies and abusing drum machines to unearth the filthiest basslines. THAT bassline. My word, it’s an absolute monster. I remember having put this song at the end of a mixtape I convinced the coach driver to stick on going to a PGL activity camp when I was about 16. To his credit, the guy didn’t eject it, and the looks I got from the other teenage passengers were priceless; especially when the little nursery rhyme bit comes in near the end. Could quite easily come from the Ninja Tune stable; a lovely downtempo trip hop number with warm synth sounds and pleasant percussion. Yet another superb track title too. Sounds like what should be playing as you whack on the hyperdrive and your spaceship zooms into the black beyond. That undulating synth line, those entrancing strings and the big fat breakbeat; just astounding. The original and possibly best. This track sonically encapsulates everything good about that early 90s crusty rave movement. It’s not hard to imagine it pumping out of some DIY rig as the sun rises over a dewy field somewhere in Southern England, with a few gurning old boys still throwing shapes. Probably the greatest music video ever made and certainly one of my favourite tracks ever made. Weird and wonky without ever losing its dancefloor rhythm, the change in tempo half way through just makes the breakdown all the more intense; and when it all goes mental at the end I’ve never seen club carnage like it. Genuinely epic. From solid gold bangers to dreamscape soundtracks, you can’t accuse Mr James of not having range. It’s hard to choose a favourite amongst the untitled bliss that is Selected Ambient Works Volume II, as there’s so much ethereal wonder on there. It comes as no surprise then, that the songs were apparently inspired by melodies heard and remembered while lucid dreaming, the sleep control technique he realised and practiced as a child. Another serene masterpiece, this time from the original Selected Ambient Works. Really haunting and powerful, it’s music to think deep thoughts to late at night. 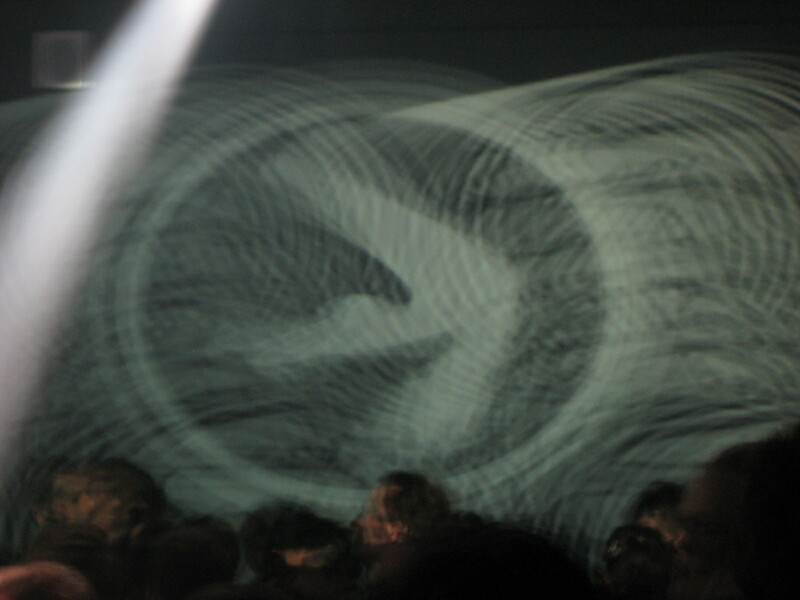 A more recent one, off the Analord series, showing that as AFX he could easily cut it making more contemporary techno. Would love to hear this out in a club on a big system. Probably the best track on 26 Mixes For Cash, for once he doesn’t mess with the original too much, just adding some extra glitch and squelch to this acid house classic. 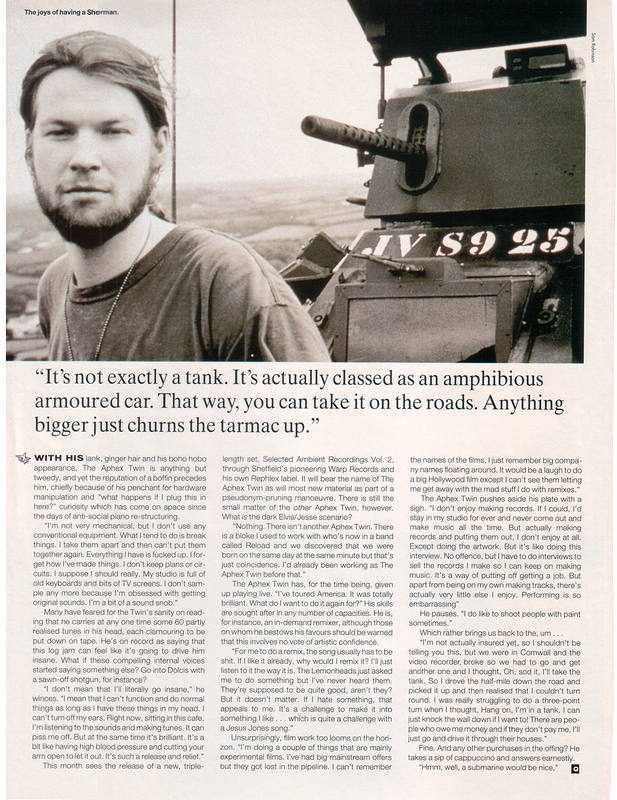 Obviously this little list barely scratches the surface, but if you want to mine the depths of Aphex Twin’s cannon, then this FACT Mag list is a pretty good place to start.